Samoa adopted a flag like today on 26 May 1948, but only with four stars (like New Zealand). The fifth star was added on 24 February 1949. In 1962 Samoa gained its independence. Flag: The Flag has a red field with a blue canton in the upper left- hand corner. Five white stars on the canton symbolize the Southern Cross constellation. The red, white, and blue colours stand for loyalty, purity, and patriotism. Adopted in 1962. The West Samoan flag was adopted 24 February 1949, when the previous design with only four stars was modified. The previous design was adopted 26 May 1948. 1962 was the year of independence under the diarchy (1963 monarchy). The Auckland Museum has a photograph of a Samoan Blue ensign on online at http://www.aucklandmuseum.com/collections (image archived here: flag; badge detail). It's clearly the same as this, but the details of the badge all differ somewhat. I wonder whether there would have been a standard pattern to these, or whether any flag showing three trees on a beach would suffice. The nearest thing to a “standard pattern” would be the illustration found in “Flags of All Nations” published under the authority of the Admiralty until the 1950s, but I suppose that if a flag was acceptable to the local authorities then it was OK. The illustration in Flags of All Nations was supposed to be based upon the original artwork that accompanied the granting of such a badge. I think we should assume that standard patterns weren't all that relevant, until there's evidence that they were. The former German islands of Samoa were seized and occupied by New Zealand forces on 29 August 1914. On 7 May 1919 the Supreme War Council of the Allies allocated the islands under mandate to New Zealand. An Order in Council passed by the Governor-General of New Zealand on 1 May 1920 provided for civil administration of the islands, and the mandate was approved by the League of Nations in December 1920. From this time until 1997 the islands were known as Western Samoa. 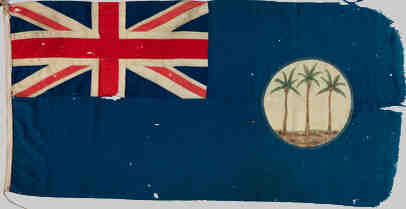 On 4 May 1921 the Government of the Dominion of New Zealand wrote to the Admiralty, requesting warrants for defaced Red and Blue Ensigns for Western Samoa, adding that, "Ensigns with three palm trees encircled, and emblazoned on the fly had been used, by officials, and by the public, since the British Military Occupation." The defaced Blue Ensign was used on land, and the defaced Red Ensign at sea. The badge may perhaps have been inspired by the single palm tree badge used on the Federal Flag of the Cook Islands, from 1892, until they were annexed by New Zealand in 1901. It was not clear whether a Mandated Territory was entitled to defaced ensigns, or whether the Administrator of Samoa was entitled to a defaced Union Jack, as if he were a British Governor. It was pointed out that if a defacement for Western Samoa was not authorised, on the grounds that the Samoans were not legally entitled to one, they would use the New Zealand flag, which was a defaced Red Ensign anyway. On 30 March 1922 the Admiralty informed the Colonial Office that they were prepared to issue a warrant for a defaced Red Ensign if the Secretary of State for the Colonies considered it more appropriate than an undefaced Red Ensign. This was approved 30 July 1922 though the warrant for the Samoan Red Ensign was, for some reason, not issued until 16 January 1925. This may have been to do with the wording of the warrant. In Protectorates the usual wording was, "vessels owned by natives of the .... Protectorate." The Warrant was eventually issued as, " ... three palm trees proper .... for vessels belonging to the inhabitants of the Islands of Western Samoa." In December 1946 the General Assembly of the United Nations approved the Trusteeship Agreement under which New Zealand formally committed itself to promote development towards self-government in Western Samoa. The first step was the passing of the Samoa Amendment Act 1947, one part of which changed the office of Administrator to High Commissioner. It seems that the High Commissioner continued to use the Administrators defaced Union Jack, even though it was not in accordance with the new status of the territory. It was reported that it was flown by him on board HMNZS Hawea at Apia on 2 March 1948, and possibly continued in use until independence in 1962. According to a letter from the Colonial Office to the Admiralty the four star Western Samoa flag that replaced the Red and Blue Ensigns was not approved until 9 September 1948. Details of the five star flag that replaced it were published in the New Zealand Gazette 24 February 1949. It was approved for general use ashore in conjunction with the New Zealand Ensign, both flags to be of the same dimensions and of the same shades of red and blue. Public Record Office documents ADM 1/8625/80. ADM 1/8690/219. ADM 1/21655. The coat of arm of Kingdom of Samoa used during 1873-1900? has a red flag with white cross and a star and motto "LE FAAMOEMOE LELEI" in Samoan language. The red flag with a white cross and star is the Kingdom of Samoa, 1873-1900, flag. The "Flags of Paradise" chart shows an older flag: a red field with a white crescent and a white 5-pointed star pointing upwards. It is labeled "Samoa 1858-1873". I find this flag rather strange. It is the only of the several flags of the chart to have a crescent, and I cannot imagine a Muslim influence in Samoa (which was under "control" of Protestant missions and Germans). In my research to uncover my own genealogical links with Samoa, I have uncovered a picture of a flag labeled "flag of Samoa". It appeared in the book Papalangee, or, Uncle Sam in Samoa: A Narrative of the Cruise of the US Steamer Narragansett, written by George B. Rieman and published in Oakland 1874. I think the only place to view this original publication is the Mitchell Library, Sydney. I viewed the publication in a microfilmed reproduction which formed part of "Samoa 1830-1900 and other research materials collected by the late R.P. Gilson", filmed by the Pacific Manuscripts Bureau (PMB # 1003; reel 3; Folders 42,43). I believe this to be a largely accurate reproduction of what I saw. The fifth stripe sat flush with the base of the canton, and there are 9 stripes in total. The canton in the original was a bit squarer than how I have drawn it here. The stars in the original were all 5 pointed and clearly white. The orientation of stars and crescents as I have drawn it may be slightly off, but they certainly formed a cross pattern around the two crescents, shown correctly. I could not determine proportions as the flag was drawn flown on a flagpole in the wind. As it was in black and white I could not tell for certain what colours the flag was, however the canton was definitely darker than the stripes. Also, reading the account itself, the captain of the ship was charged with giving a speech to Samoan natives to encourage them to allow the US to annex the Samoan Islands. The flag may even have been designed by the US themselves, Thus I would strongly suspect that the flag's colours were the same as the 'Stars and Stripes', (which would interestingly also provide continuity with the current flag of Samoa). The date of the visit to Samoa I think was some time in 1872, and the account states that "the United States is a nation of thirty four states and forty million people", although I can't determine what period that would have been based on my rudimentary knowledge of American history. I also find it interesting that this design had crescents on it considering the 1858-1873 flag also had a crescent. Ivan Sache found this flag strange, questioning why there would be a Muslim influence in Samoa. I would say with near 100% certainty that the crescents here do not symbolise Islam. It is a co-incidence, and I would suspect that the moon has significance in Polynesian symbolism. Furthermore, another point of interest for the flag that I discovered, is that the arrangement of the crescents can be seen to spell out the letter "S", for Samoa. I wouldn't know whether that was intended or not. The flag corresponds to the League of Tutuila, and it was created by the commander of the Narrangaset, Meade on 1872. The bands, apparently of various colors, symbolize the islands. The two half moon form a "S". This design influenced the modern flag of Samoa. 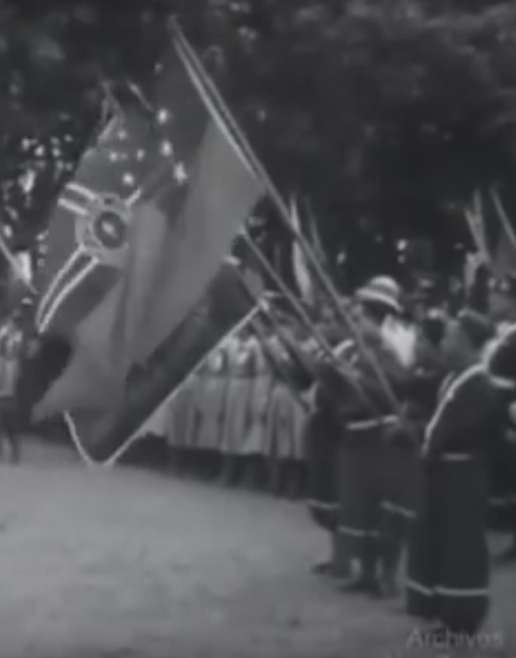 In a YouTube video of the Western Samoa Independence Ceremony, New Year's Day 1962: https://www.youtube.com/watch?v=NJDs-2_N0xI, at 3 minutes 12 to 15 seconds there appears a flag which bears striking semblance to several historic German flags, particularly the Third Reich Kriegsflagge. This would be the flag of the Germany Colonial Society based on the star constellation that seems to be on the flag.